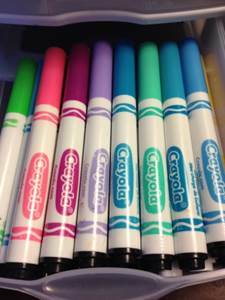 Part of running a household involves helping the children with school assignments. 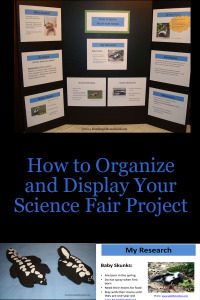 We recently pulled together a project for a science fair. 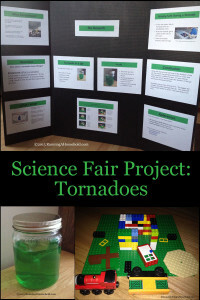 Here are the details on how we gathered the information and organized our science fair project: tornadoes. We really thought it was important to let our child take the lead on the topic. 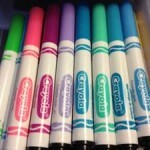 It needed to be something he was interested in, and wanted to learn more about. Our son has always been interested in the weather. In June 2011, a tornado came through Western Massachusetts. It brought down trees in Westfield, damaged houses in West Springfield, and made a destructive path through the cities of Springfield, Wilbraham and Monson. Our son saw some of the tornado aftermath, since the areas were bare for years. He was very involved, since we made a gift basket to help a family who lost everything, including their toys. 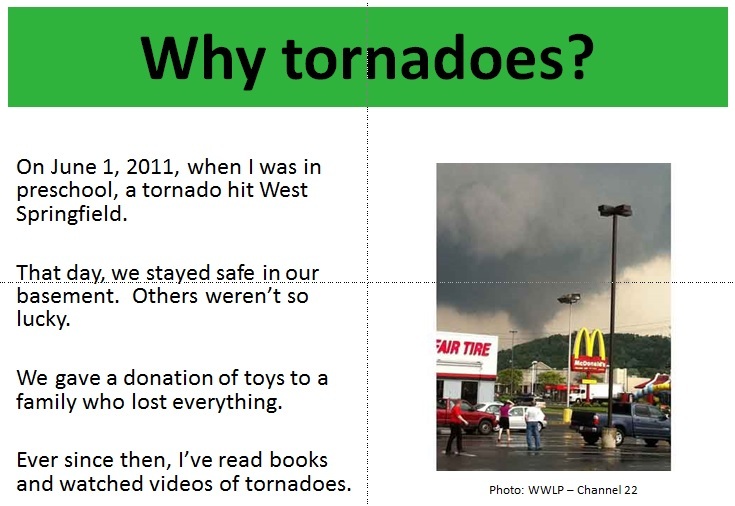 Websites: The following websites were very helpful for researching tornadoes. Videos: We actually found several videos on YouTube which showed the different strengths of tornadoes. 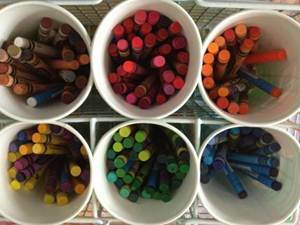 Since our son was only in second grade, we simplified some of the sections. 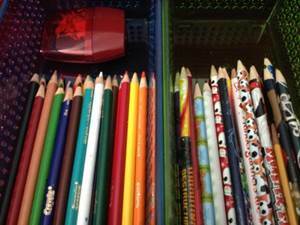 We followed the general format for reporting. 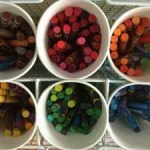 We drafted the information by talking with our son, and writing down what he said. Then we put the information into a Powerpoint presentation with pictures. Display Board: We printed the slides, and glued them to the Elmer’s Tri-Fold Premium Foam Display Board, Black, 36×48 Inch . 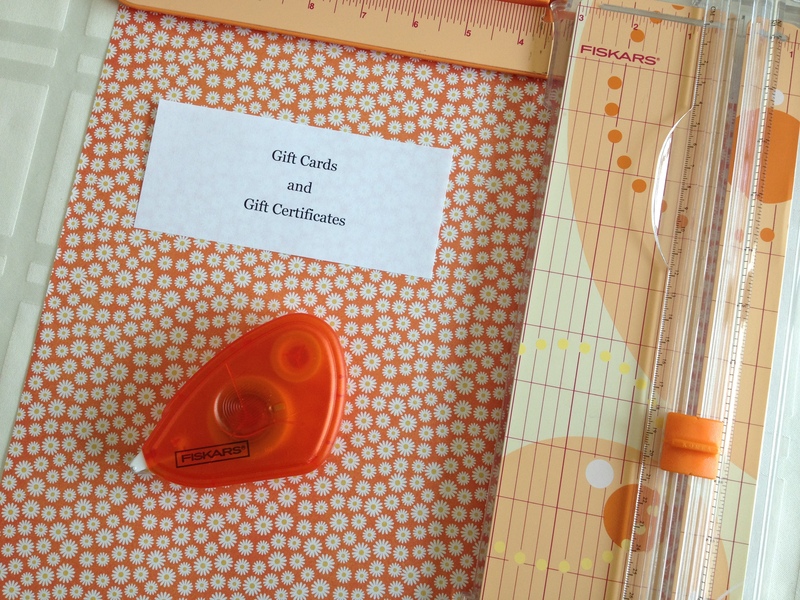 We opted for this size because it could display all of our information. 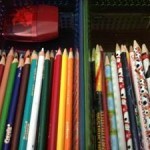 It was also manageable to carry in to school on the day of the project. 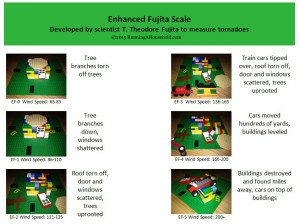 Legos: We demonstrated the different strengths of a tornado based on the Fujita scale. Our son was fascinated by this scale, and used his legos to show the destruction from an EF-0. We took a picture of it, and then he increased the damage by using his legos to create the devastation from an EF-1. Again we took a picture. He continued to model each level from EF-0 to EF-5. 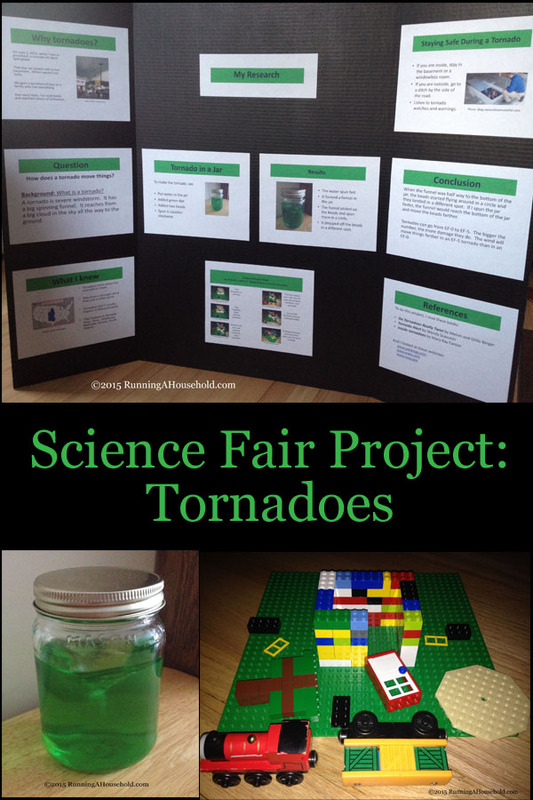 Tornado in a jar: To show the circular motion of a tornado, and how the force picks up objects, we created a tornado in a jar. 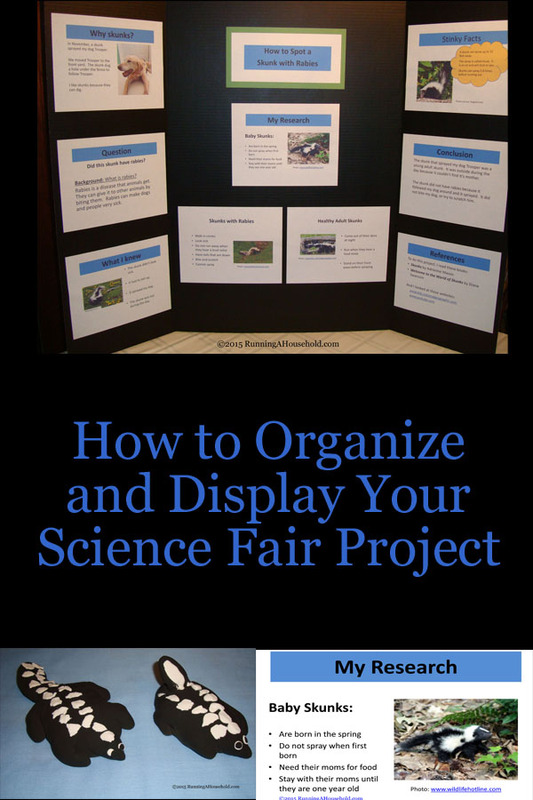 The final display board was set up on a table at the science fair. 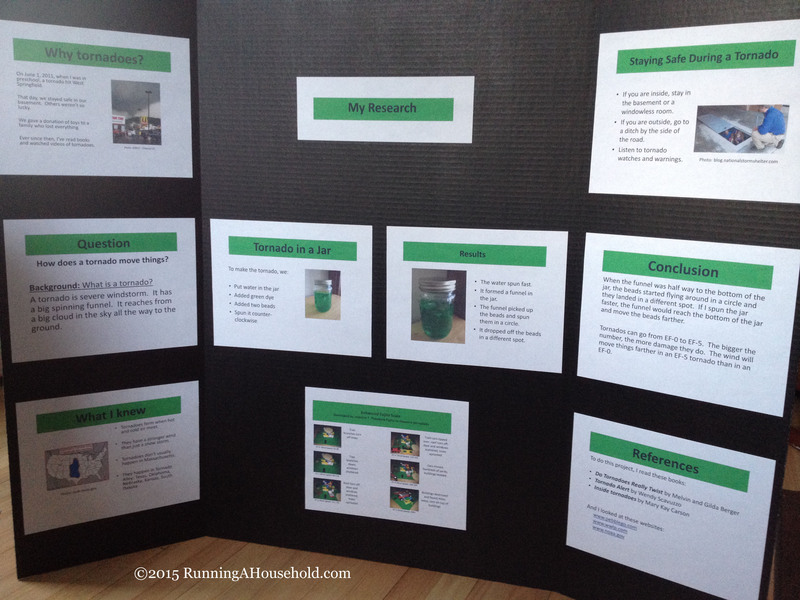 Here’s a close up of our tornado in a jar, which was on display at the science fair. 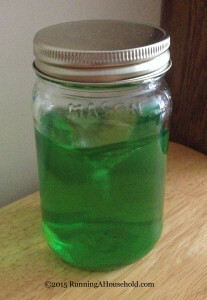 We started by placing three small beads and some water in a mason jar. When we swirled the water, the tornado was hard to see. We added some green food coloring, and it was much easier to see the tornado in the jar. So we moved the jar counter-clock-wise, and soon the power of the water picked up the small beads. Here’s one of the lego displays. This one is an EF-3 on the Fujita Scale. 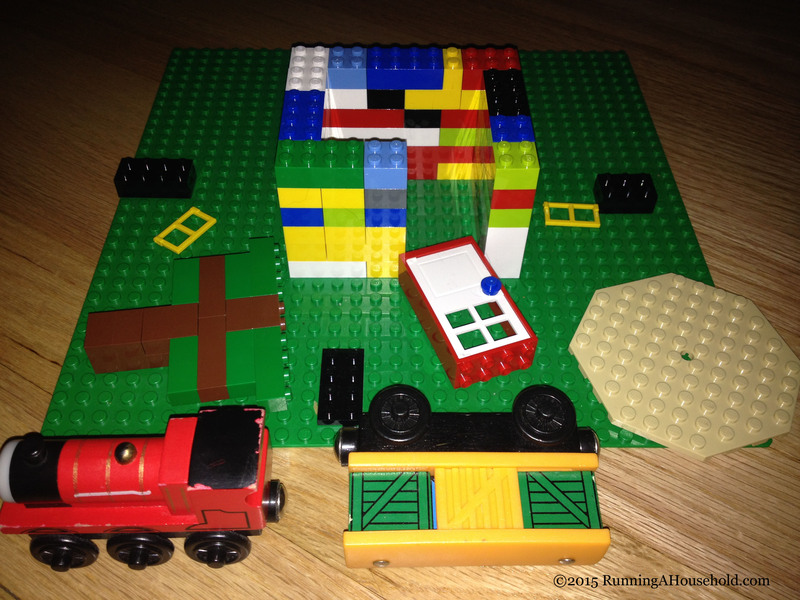 Our son even added some of his Thomas trains boxcars to show the tornado damage. There was a special slide on the presentation board. 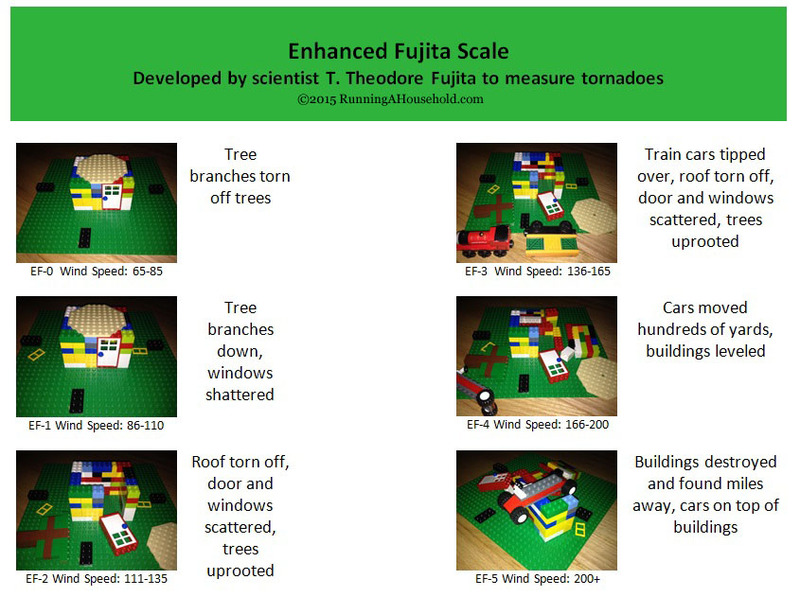 It showed all of the levels of the Fujita Scale, from EF-0 to EF-5, along with a picture of his lego displays. Click on the link below to see a larger view of our slide. This entry was posted in Organization and tagged science fair on November 7, 2015 by Running A Household.